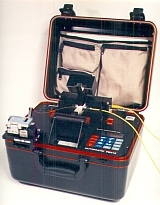 Explosion-proof miniature fusion splicer, optimized for on-aircraft repair and maintenance of fiber optic cables. The fully-automatic miniature modular fusion splicer creates low-loss and highly stable splices in any optical fiber from 5.8/125 µm single mode up to 200/230 µm multi-mode. Its explosion-proofing system enables the splicer to operate safely in any hazardous atmosphere, including fueled aircraft. The splicer is so small it can be used one-handed and so stable it can operate properly in any orientation, from level to sideways to upside-down. It is rugged enough to satisfy MIL-PRF-28800F requirements, including vibration, mechanical shock, thermal cycling, high humidity, salt spray, sand-and-dust, and shock/drop. Its electromagnetic compatibility (EMC) renders it both immune to ambient EMI and shielded against emissions which might interfere with other nearby equipment. With the smallest fusion head on the market, the Aurora MiniMod can go anywhere. 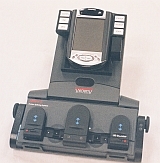 Aurora has created the world’s smallest hand-held fully automatic 3-axis aligning fusion splicer. About the size of a digital camera, the MiniMod fusion head can go anywhere – up a ladder, hanging from overhead aerial strand, or into the tightest of cramped cabinets. Perfect for Fiber to the Home (FTTH). The MiniMod can splice within one inch of a closure, tray, junction box, wall, or conduit, minimizing the need for fiber slack. It can splice properly whether level, vertical, sideways, or even upside down. And with the low-profile sliding fusion cover there is minimal clearance required from overhead obstructions. Operate in any orientation - even upside down - with Aurora's Altima X hand-held fusion splicer. Not only is the Altima X fully automatic, it combines in its miniature fusion head BOTH state-of-the-art fiber alignment technologies, Profile Alignment System (PAS) and Local Injection/Detection (LID), for the ultimate in splicing precision and versatility. About the size of a hard-cover book, the Altima X fusion head can go anywhere – up a ladder, hanging from overhead aerial strand, or in the tightest of cramped cabinets. Perfect for Fiber to the Home (FTTH). Originally designed for the US Navy for shipboard repair of fiber optic cable, the Altima X can splice within one inch of a closure, tray, junction box, wall, or conduit, minimizing the need for fiber slack. It can splice properly whether level, vertical, sideways, or even upside down. And with the low-profile sliding fusion and LID covers there is minimal clearance required from overhead obstructions. Introducing the latest in polarization-maintaining (PM) fiber splicing, the Fusion 4000. Aurora introduces the latest in automatic polarization-maintaining (PM) fiber splicing, the Fusion 4000. Based on newly patented technology, the Fusion 4000 can determine the fast and slow axes of any standard PM fiber faster and more accurately than any previous splicer. It also core-aligns and splices all other standard fibers, including SMF, DCF, NZ-DS, Er-doped, and multi-mode, using both PAS and LID techniques, for the ultimate in splicing versatility. Aurora's Fusion 3500MZ offers unprecedented versatility and splicing power. 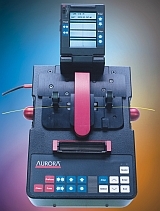 Aurora introduces self-positioning Profile Alignment System (PAS) splicing in the new dual-mode Fusion 3500. Sub-pixel image processing in both x and y axes simultaneously allows alignment, splice, and loss estimate in typically 10-15 seconds. When desired the splicer can also operate in core-to-core Power Alignment (LID) mode, giving unprecedented versatility and splicing power. Motorized Z-axis (MZ) set-up of both fibers not only simplifies your fiber placement but corrects modest overlap automatically. Aurora's Fusion 3000MZ - ultra-fast PAS splicing. 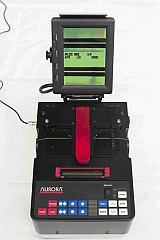 Aurora introduces ultra-fast Profile Alignment System (PAS) splicing in the Fusion 3000. Sub-pixel image processing in both X and Y axes simultaneously allows alignment, splice, and loss estimate in typically 8 seconds. 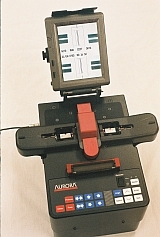 A fully automatic fusion splicer from Aurora, a leader in fiber optic fusion splicing since 1978. The sleek Fusion 2500 combines two simultaneous (X-Y) views of te fibers on a fully-tiltable video monitor. The Power Alignment Technology (PAT) provides the lowest losses and most accurate loss estimates available on all colors of standard fiber coatings. The FW312 is cost effective, highly reliable, and provides consistent, accurate results. 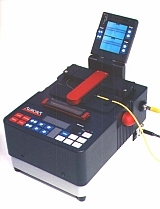 The FW312 is a fully automatic arc fusion splicer using advanced LID technology. Microprocessor controlled and built for field operations in the real world, this splicer is designed to be adaptable to many situations and to give the installer a fast and accurate result. It is cost effective to purchase, operate, and maintain. The FW312 has the most powerful LID system on the market, with a history of proven reliability. The FW312 is user friendly and is engineered for one button splicing. All fiber types can be spliced, including multi-mode, single mode and specialty fibers. The case contains all tools and accessories. Aurora Optics fiber splices… state-of-the-art splices and closures in one. A number of significant features make Aurora’s crimp-and cleave splice ideal for applications in the field. The crimp-and cleave splice is fast and simple. It requires only hand tools for assembly. No electric power is required. In addition, no chemical usage is required by the user, except for cleaning the fibers. 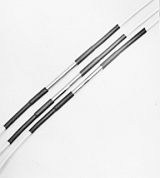 It’s use of prefilled index oil eliminates reflections due to end gap delamination, which can normally be expected in epoxied splices. Most important, the splice captures Kevlar or fiberglass strength members in the same miniature housing, providing 50 to 85 lb. strength restoration to complete single-fiber closure. It's a complete splice and cable strength restoration in one.